After Phamly reunions galore in our hometown, we went to Berlin and did what everyone should do - went grocery shopping at Lidl. It has anything and everything, and all of it is so good. We went a bit nuts though so had a lot food stuffed in our bags on the last train ride out to Prague at the end of our stay. Berlin is a mix of modern and historic buildings. 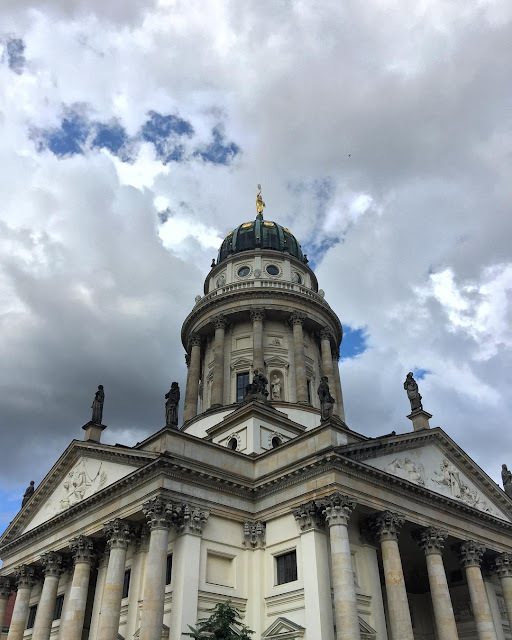 We went to the museum island, but by this time I was over seeing so many museums so we just went walkabouts around outside. We indulged in tourism life and took a tour boat along the river, then had late lunch on the needle (rotating tower) and enjoyed panoramic views of the city and a bit of motion sickness too. There was a massive rainbow the day we went so that made it even prettier. The Reichstag building tour is an interesting insight into the modernisation of an old, historic building. Worth the visit if you're into, you know, knowledge and whatnot. For those of you who don't like to think much, then I recommend walking through the neighbouring massive park and gardens by the Reichstag building. We wandered around for hours just chilling, and climbed the tower at the round-about at the centre of it all to get a beautiful view over the park and city. Berlin is a very liveable, I can see why so many Aussies move here. Berlin is also where I had a Tinder win. My last and only fun online date I've had in a long time. I've since quit online dating altogether. Berlin date was a funny, intelligent, interesting, well-rounded human being. He and all the other European matches I chatted to showed me it's not the dating app I don't like, it's the people on the app that make or break it. Sorry, Brisbane men, I'm not that into you.